Sunday’s loss was the 45th for Felix Hernandez in which he gave up one run or less. No pitcher in baseball history has had a more futile career so young. But he’s turned 30. Do the Mariners hear his clock? Two decades later, with a park that plays completely opposite of the Kingdome, the team is reversed: Way more pitching than hitting. Actually, he didn’t say that. He could have. Probably should have. But that’s not how The King rolls. Yes, it’s early April. Yes, it’s a long season. Yes, a lineup this experienced, with a club-record $134 million payroll, is more likely than not to improve. Hernandez turned 30 April 8. It’s his 12th major league season. His fastball, once in the high 90s, now is 89-91 mph, just a few ticks above his still-wicked change-up. In 13 innings so far, he has given up four hits and one run and is 0-1. In the season opener in Texas, he had a 100-year loss: First pitcher in baseball history to lose a season-opening one-hitter of at least six innings. The acme of futility. For years, so it has been. Stop it! Just come out and say we’re not going to do anything! You know nothing’s going to get accomplished! You know it doesn’t matter whether something’s accomplished or not! That thought occurred watching Griffey Friday throw out the ceremonial first pitch to Hernandez, catching behind the plate: So much celebrated optimism surrounded the greatest talents of their generations, and across four decades, there was so little to show for it. The pair combined for 18 playoff games, all Griffey’s. None of them in a World Series. The premise was that his game Sunday represented the 45th start in which he allowed zero runs or one run and didn’t get credit for a win. Among active pitchers, only the Diamondbacks’ Zack Greinke shared similar numbers, thanks mostly to the seven years he spent in Kansas City when the Royals were terrible. Based on a metric called Game Score, which calibrates pitching stats on a zero-to-1oo scale with the average being 50, ESPN calculated that Hernandez, because he was pitching slightly better, yet getting less results, was the unluckiest pitcher in MLB history. It’s safe to say that, because Greinke is two years older and now playing with better teams, and Hernandez keeps wanting to stay with the Mariners, The King will eventually claim the title Unluckiest Pitcher on the Face of the Earth (h/t Lou Gehrig). Difference-making talents come along so rarely — especially with the Mariners’ dubious history in player development — that a failure to capitalize on their prime productive years is a profound shame. In Griffey and Hernandez, the Mariners grew their own. But those examples are few and far between in Seattle, forcing the front office to mortgage the future with huge long-term deals to free agents like Robinson Cano and Nelson Cruz. It’s the hard way to do the business of baseball. It’s how the Mariners have come to be the oldest team, 30.1 years, in MLB by average age in 2016. Hernandez last year had his highest ERA (3.53) since his age-21 season of 2007, largely because of some horrific innings where he lost control of the ball. Whether those games were outliers or omens remain to be seen, but it is not unreasonable to say that career decline has begun. Whether the decline will be gentle or precipitous also is not known, but getting stiffed by your teammates 45 times has to take its toll. Unlike Griffey, Hernandez has not betrayed a single moment of aggravation at his circumstances. He continues to be the ultimate supportive team guy. Maybe it’s time for Hernandez to call out his clubhouse, although a cry of “win one for Fifi!” sounds a little uninspiring. Frankly, there’s not much else to be done. It’s already an experienced team, and there’s no hot prospect on the farm likely to be above major league average. True, it is early in the season. It’s also true it’s getting late in Hernandez’s career. I was surprised he re-signed – I would have gone to greener pastures, knowing I was on the downside of my career. A ring means something and when you have been the best at your craft, the money will always be there, so a championship is the one thing he doesn’t have. To sit through games he does, such as these first two, must be brutal. There has to be a “here we go again” subconscious message that pops up as he sits there and to never see any rage or evident emotion from the guy is remarkable. The M’s have essentially sucked his whole career and can you imagine what his lifetime record would be if he were on a decent, let alone, excellent team? If he were on a decent team in a media market he would have won atr lest another 2 Cy Young’s, so he has given up much. He is, however, comfortable financially and personally. Well it’s the third inning…. Texas has the bases loaded with 1 run in already….. I predict more runs this inning & loss number 5 in a row. We all know the M’s can’t score 3 runs & win at Safeco. This game is already over…… sigh. Well, a play by play vent. You obviously tired out. So was I wrong? They got their rear ends absolutely kicked again & could only scrounge up 4 stinking hits. Seager of course couldn’t even drive in ONE lousy run with a sac-fly. He’ll fly out any other time, but not to score a run. Bases loaded with 1 out & as usual these goofballs drop a ZERO. Sorry to report to you: They won a game. Had a breaking ball in the dirt been thrown instead of a high fastball down the middle…. the M’s would have undoubtedly found a way to lose again. Everyone knows they can’t score any runs at home. Just ask Mr Inning Killer Kyle Seager. Thanks Miley for giving up ANOTHER 3 run HR…… second start in a row. Of course that bum Beltre hits it, of course he sucked hard for the M’s & has been a perennial All Star since leaving. They’re down 5 runs so this game is already lost, how many more runs will the Rangers tack on? I predict a 11-1 final. I think the M’s can mount a comeback tonite, they’re only behind by more runs than they’ve scored in the last 5 games….. speaking of these 5 stellar games: the opposition starters have allowed 4 ER over 30 IP for a 1.20 ERA. The M’s have allowed 15 ER over 30 IP for a 4.50 ERA. The M’s scored 2 runs off a SP ONCE, while it has been done to them 4 times. This team is so awful, it’s getting to be hilarious. Cano failing in consecutive AB’s with runners on was totally expected. Beltre killing the M’s at Safeco again was totally expected, too bad he was a bum who couldn’t hit there at all when he was a Mariner. He was an absolute bum for Seattle & a Hall of Famer since. When these goofballs actually win a home game, they’re going to be laughed at. This team at Safeco is great comedy at this point. I can’t wait for teams with REAL players like KC & Hou to come to town to murder these clowns. The worst aspect was the A’s shutdown from three ordinary A’s pitchers. Well, that cheers us all up. I’m starting to wonder if I missed the article where a Mariners fan was barred from entering Safeco field because they brought their goat to a game back in 2003. Aside from a curse, it’s difficult to imagine this level of futility. When in doubt, it’s the marine layer. Do you think Felix gets frustrated? It’s another hum-drum, numb, crumb-bum of a game, much like the 8-0 loss to the Rangers we just suffered through. Felix pitches tomorrow. He watches another inning end in futility and walks back up the tunnel to the clubhouse. He looks for the senior clubhouse attendant, the one who has been around. Felix has a few specific words with the attendant, sending him on his way with a crisp picture of Benjamin Franklin to take care of the details. The next day, just before game time, Scott Servais is about to huddle up the team and say a few pre-game words. Felix puts a hand on his shoulder and shakes his head… “I’ll take this.” Felix walks to the center of the locker room, a bat on his shoulder, dragging behind him a standard metal trash can. Not plastic, but the old-fashioned kind – galvanized metal with a lid. 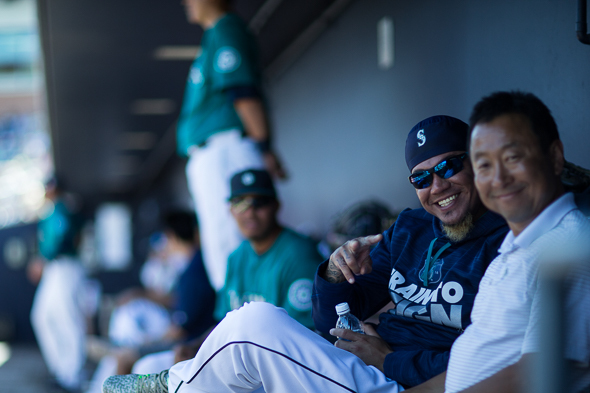 That senior clubhouse attendant knows just what Felix was talking about. Felix places the trash can in the center of the locker room, looks around slowly to the silent faces, and raises that bat up high over his head. He pauses for just a beat, and brings that bat down on that trash can with a mighty crash. The next blow sends the lid careening towards the showers, The third and fourth put dents in the side that make restoration to its original shape impossible. Felix takes a deep breath and pounds that trash can one last time, his frustrations gone with the ringing echoes in the silent locker room. He holds out the bat, handle first, and looks around slowly to the silent faces of his teammates. It would be fun to make up a miraculous story about how the rest of that game went – the offensive explosion, the joy on everyone’s face, the win for Felix. It would be fun to make up a story about how that trash can was mounted, as is, on a beautiful base of stained mahogany with a plaque that said “2016 Mariners” and a translation of the unprintable equivalent of the phrase “Heck, yeah!” in every language spoken in that locker room. How that trophy went on the road (with its own seat on the plane) to make an appearance in every game for the rest of the season. But you get the idea. Sometimes you get frustrated and you just gotta take it out on something. “my room mate Lizette Is getting. pay on the laptop 98$/hr.”…. !i342two days ago an awesome black McLaran P3 bought after earning 18,512 DoIIars,,,this was my previous month’s payscheck ,and-a little over, 17k DoIIars Last month .,,3-5 hours job a day..with. extra open doors &. weekly. payschecks…it’s realy the simplest. job I have ever Do.. I Joined This 7 months. ago. and now making over. 87 $, p/h.Learn. More right Here!i342➤➤➤➤➤ http://GlobalSuperJobsReportsEmploymentsGreenGetPayHourly98$…. .❖❖:❦❦:❖❖:❦❦:❖❖:❦❦:❖❖:❦❦:❖❖:❦❦:❖❖:❦❦:❖❖:❦❦:❖❖:❦❦:❖❖:❦❦:❖❖:❦❦:❖❖:❦❦::::::!i342……. Who plays the roles of James Earl Jones and Kevin Costner in your fantasy sequel, “Team of Screams”? two days ago black McLaren P3 I bought after earning 18,512 Dollars,,,it was my previous month’s paycheck.just a little over.17k Dollars Last month.3-5 hours job a day…with weekly payouts..it’s realy the simplest. job I have ever Do.. I Joined This 7 months. ago. and now making over. hourly 87 Dollars… Learn. More right Here!iv342:➽:➽:➽➽➽➽ http://GlobalSuperJobsReportsEmploymentsHelpfulGetPayHourly98…. .❖❖:❦❦:❖❖:❦❦:❖❖:❦❦:❖❖:❦❦:❖❖:❦❦:❖❖:❦❦:❖❖:❦❦:❖❖:❦❦:❖❖:❦❦:❖❖:❦❦:❖❖:❦❦::::::!iv342………..
Steve may not make it until Memorial Day. Time to line up the next one Jerry. Feel the same when the Seahawks were 2-4? I know, I know, Seahawks have a history of success. Still it’s five percent of the season. Save for 3 late innings of offense in Texas, the M’s would be 0-8 now. But it’s still early, so 2-6 or 0-8 doesn’t matter…… that clown Dave Sims just made another comment about the M’s fans panicking already…… he needs to go ASAP, we as the fans have seen this movie YEAR after YEAR after YEAR, so he along with M’s management thinks we are stupid & don’t know what we are watching. What was the context of Sims’ comment? That fans should just relax? If so, um no. It’s very important to get off to a good start in April. Look at Houston last year. Heck, look at the 2001 M’s. I think they were 20-4 in April that year. Baseball is such a confidence sport, getting out of the gate quickly can carry you through the season. He was mentioning a radio show that day…. most likely Softy Mahler on KJR. Sims was indicating the fans & sports radio are in panic mode for no reason. The fact IS, the fans have every right to panic & be frustrated, the M’s consistently put out a mediocre product. They battle for last place year after year & obviously it doesn’t bother Sims, after all the team pays him well to be a yes man, paint a rosy picture & buy expensive blinders for his eyes.